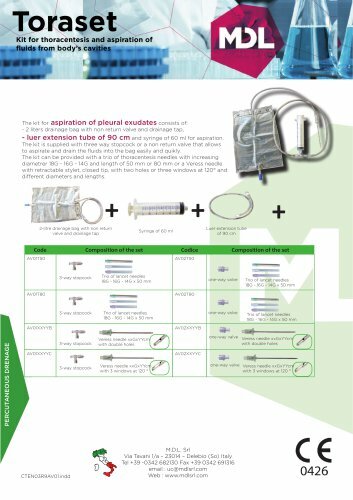 Kit for thoracentesis and aspiration of ﬂuids from body’s cavities The kit for aspiration of pleural exudates consists of: - 2 liters drainage bag with non return valve and drainage tap, - luer extension tube of 90 cm and syringe of 60 ml for aspiration. The kit is supplied with three way stopcock or a non return valve that allows to aspirate and drain the ﬂuids into the bag easily and quikly. The kit can be provided with a trio of thoracentesis needles with increasing diametrer 18G - 16G - 14G and length of 50 mm or 80 mm or a Veress needle with retractable stylet, closed tip, with two holes or three windows at 120° and different diameters and lengths. 2-litre drainage bag with non return valve and drainage tap Trio of lancet needles 18G - 16G - 14G x 50 mm one-way valve Trio of lancet needles 18G - 16G - 14G x 50 mm one-way valve Trio of lancet needles 18G - 16G - 14G x 50 mm PERCUTANEOUS DRENAGE Luer extension tube of 90 cm Trio of lancet needles 18G - 16G - 14G x 50 mm one-way valve Veress needle xxGxYYcm with double holes Veress needle xxGxYYcm with double holes Veress needle xxGxYYcm with 3 windows at 120 ° one-way valve Veress needle xxGxYYcm with 3 windows at 120 ° M.D.L. Srl Via Tavani 1/a – 23014 – Delebio (So) Italy Tel +39 -0342 682130 Fax +39 0342 691316 email : uc@mdlsrl.com Web : www.